At the northernmost limits In the United States for the natural range of bald cypress trees, this 100-acre nature sanctuary recalls a time some 100,000 years ago when cypress swamps were common over large parts of the region and now-extinct animals like mammoths roamed the landscape. Today, thanks to The Nature Conservancy, which acquired the property in 1957, the Sanctuary's primeval beauty is a protected home to many plants and animals. As you walk on the quarter-mile boardwalk trail, listen to nature's harmony of calling frogs and songbirds. With quiet patience and sharp eyes you may even catch a glimpse of some of the abundant life supported by this wetland. Inside the nature center, you can explore more closely the mysteries of the swamp through exhibits that focus on the natural and cultural heritage of the area. 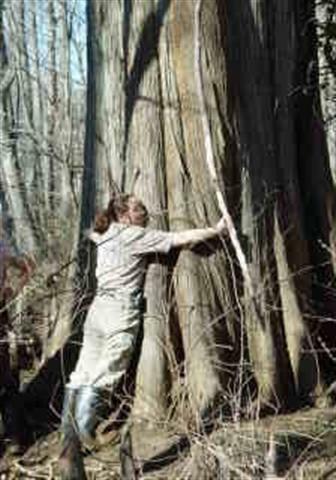 Battle Creek Cypress Swamp Sanctuary is a partnership between Calvert County Natural Resources Division and The Nature Conservancy. The Sanctuary is a part of the Chesapeake Bay Gateways Network. Groups larger than 10 people must make advanced reservations. Mon-Fri: 9 a.m. to 4:30 p.m. Sat: 10 a.m. to 4:30 p.m.
Sun: 1 p.m. to 4:30 p.m.
Sun: 1 p.m. to 6 p.m.
Closed most County holidays. Check the Park Hours page for updates.